Three weeks in a row! It's definitely a feature now! 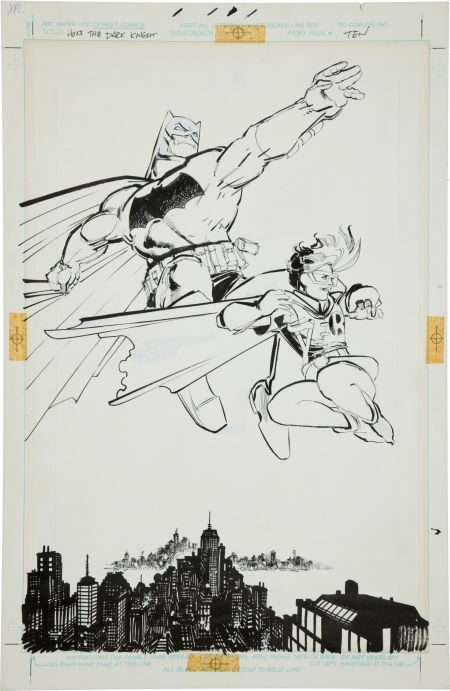 The original art for one of the best-known images from Frank Miller's The Dark Knight Returns is going up for auction with an expected selling price somewhere in the $100,000 neighborhood. I point it out not for the price tag, but because Heritage Auctions has a really good scan of the piece and you can examine the linework very closely. What I find particularly interesting is how clean the overall image is, but how much rework was done on Batman's cowl. Gem City Comic Con is this Sunday at Wright State University. I won't be attending, but it still sounds kind of cool. Next Tuesday, Neil Cohn will be speaking in San Francisco at a panel entitled "The Impact of Structure and Meaning on Sequential Image Comprehension." Sounds interesting to me, at any rate. Al Bigley recently reminded his friends on Facebook that he posted a "rare" 1966 Captain America song from Tifton Records a couple years back. An interesting listen, as it's very different stylistically from both the Grantray-Lawrence cartoon theme song and the Icarus song I noted a few weeks ago. An interesting listen. Keeping on the audio side of things, did you know that in 1978 a chap by the name of Domenico "Meco" Monardo recorded a disco version of the John Williams music from Superman? I'm betting you did not.